Canada’s top junior golfers will compete in Cobble Hill, B.C. from May 12-15 as CN Future Links begins its 12th championship season with the CN Future Links Pacific Championship at Arbutus Ridge Golf Club. The tournament marks the first of six regional CN Future Links Championships held in each region of Canada, showcasing two divisions: Junior Boys 18 years and under and Junior Girls 18 years and under. The CN Future Links Pacific Championship will see 99 golfers competing in a three-day 54-hole stroke play competition. “We’re excited to host players of this level and age at Arbutus Ridge”, comments General Manager Jason Lowe. “Hosting the event aligns well with all our GolfBC Grow the Game Programs and very popular Junior programs at Arbutus Ridge”, finishes Lowe. In the Junior Boys division, the top six competitors from each CN Future Links Championship will earn exemptions into the 2011 Canadian Junior Boys Championship held August 1-5 at Morgan Creek Golf Course in South Surrey, B.C. The Junior Girls champion from each CN Future Links Championship earns an exemption into the 2011 Royale Cup Canadian Junior Girls Championship at QGolf Club in Richmond, B.C. held August 1-5, in addition to an exemption into a CN Canadian Women’s Tour event. Team Canada’s Development Squad will be well-represented at Arbutus Ridge in both the Junior Boys and Junior Girls divisions. Last year’s CN Future Links Pacific Junior Boys champion, Adam Svensson of Surrey, B.C., returns to defend his title. In 2010, Svensson, 17, also won the B.C. Junior Boys Championship, B.C. Men’s Amateur Championship, Callaway Junior World Golf Championship and the Canadian Juvenile Boys Championship. Also competing will be Richard Jung, 18, of Toronto, winner of the 2010 Canadian Junior Boys Championship and 2010 CN Future Links Ontario Championship. Wilson Bateman of Edmonton rounds out the Team Canada trio as the 17-year old looks to improve on his runner-up finish at the 2010 CN Future Links Pacific Championship. On the women’s side, Mississauga’s Brogan McKinnon, 16, will look to build on an impressive 2010 season that included victories at both the Toronto Star Women’s Amateur and 2010 Ontario Summer Games. Also competing are Augusta James, 18, of Bath, Ont., who won the 2010 Ontario Junior Girls Championship as well as fellow Team Canada members Taylor Kim, 16, of Surrey, B.C., Jisoo Keel, 15, of Coquitlam, B.C. and Leilanie Kim, 18, of Surrey, B.C. Starting times, post-round results and a full field list are available online. The CN Future Links tournament schedule also includes the CN Future Links Ontario Championship (June 2-5 at Deerhurst Highlands Golf Course in Huntsville, Ont. ), the CN Future Links Prairie Championship (June 27-30 at The Willows Golf & Country Club in Saskatoon, Sask. ), the CN Future Links Quebec Championship (July 10-13 at Milby Golf Club in Sherbrooke, Que. ), the CN Future Links Western Championship (July 11-14 at Wolf Creek Golf Resort in Ponoka, Alta.) and the CN Future Links Atlantic Championship (July 18-21 at Sussex Golf & Curling Club in Sussex, N.B.). CN Future Links is Canada’s national junior golf program conducted by Golf Canada, the Canadian Professional Golfers’ Association (CPGA) and Canada’s provincial golf associations. The program is designed to forge a link between Canada’s youth and golf to ensure the future of the game in Canada. Since the inception of the program in 1996, more than 909,000 young Canadians have taken part in CN Future Links. A number of new initiatives including the recently launched Learn to Play program have succeeded through CN’s sponsorship of the program. For more information, visit www.cnfuturelinks.com. Golf Canada’s CN Future Links program is sponsored by CN, and proudly supported by ClubLink, Heritage Canada and the National Golf Course Owners Association (NGCOA). Canadian National Railway Company and its operating railway subsidiaries – spans Canada and mid-America, from the Atlantic and Pacific oceans to the Gulf of Mexico, serving the ports of Vancouver, Prince Rupert, B.C., Montreal, Halifax, New Orleans, and Mobile, Ala., and the key metropolitan areas of Toronto, Buffalo, Chicago, Detroit, Duluth, Minn./Superior, Wis., Green Bay, Wis., Minneapolis/St. Paul, Memphis, and Jackson, Miss., with connections to all points in North America. For more information on CN, visit the company’s website at www.cn.ca. CN is proud to support golf in Canada and is pleased to bring the best of women’s professional golf to Canada with its title sponsorship of the CN Canadian Women’s Open and the CN Canadian Women’s Tour. In addition to supporting women’s golf, CN contributes to the development of golf among young people across the country through its sponsorship of the CN Future Links program. CN is pleased to work with Golf Canada to help develop golf as a sport for women and juniors across Canada and to increase the accessibility of golf to recreational and competitive golfers. Visit www.cn.ca. Established in 1911 and the second oldest professional golf association in the world, the Canadian Professional Golfers' Association is a non-profit Association comprised of 3,700 golf professionals across the country. The Association’s mandate is to develop, promote and support our Members as experts in the game and business of golf and, in so doing, serve both its Members’ needs and those of the golfing public through the Association’s varied programs and events. The Association consists of the National Office located in Acton, Ontario and nine Zone Offices across the country. For more information please visit www.cpga.com. Canada’s National Amateur Team program incorporates advanced coaching, sport science expertise, training camps and world-class competition. Golf Canada allocates over $1 million of its resources annually to the National Team program, encompassing strength and conditioning, sports psychology, nutrition, biomechanics and technique development. Players who are selected to the National Amateur and National Developmental Teams represent Canada at six to 10 internationally-sanctioned golf competitions throughout the year. The intent of this comprehensive program is to aid Canada’s top up-and-coming amateur players in all areas of their development, helping Canada produce the best golfers in the world. Team Canada, the pinnacle of Golf Canada’s High Performance Program, provides access to world-class resources including coaching, nutrition, sport science, mental management, equipment and elite competitive opportunities. The program builds on the support team members have received in their development years from their family, member clubs, personal coaches, university programs and provincial golf associations. Golf Canada’s High Performance Program and Team Canada are proudly supported by RBC Wealth Management, Titleist, Foot-Joy, Under Armour, ClubLink and Heritage Canada. For more information about Team Canada or to make a donation towards the development of Canada’s future golf stars, please visit www.golfcanada.ca/teamcanada. Golf Canada – a member-based organization governed by the Royal Canadian Golf Association (RCGA) – is the governing body of golf in Canada, representing close to 350,000 members at almost 1,500 clubs across the country. 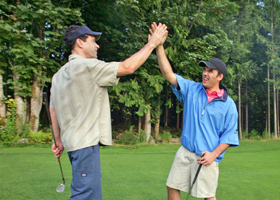 Recognized by Sport Canada as the National Sports Organization (NSO) for golf in this country, Golf Canada is responsible for promoting participation in and a passion for the game of golf in Canada. Golf Canada actively conducts championships, programs and services to help shape the present and future of golf in Canada. High performance athlete development, National Golf in Schools, Golf Fore the Cure, the Canadian Golf Hall of Fame and Museum and CN Future Links, Canada’s national junior golf program, are only some of the initiatives the association leads for golf in Canada. As the authority for golf in Canada, the association also administers the Rules of Golf, amateur status and handicapping and course rating under the respected RCGA brand. In addition, Golf Canada conducts Canada’s most prestigious golf championships. The RBC Canadian Open and CN Canadian Women’s Open attract the best professional golfers in the world, while regional junior and national amateur championships provide world class competitive opportunities for Canada’s top golfers to showcase their talents. For more information about what Golf Canada is doing to support golf in your community, visit us online at www.golfcanada.ca.